In our last two blogs (Part 1 - Brand storytelling inspiration for higher education & Part 2 - How storytelling can transform your digital strategy) we have taken a look at the formula behind a great story and we have looked at how some of the world's most recognizable brands are successfully telling stories. 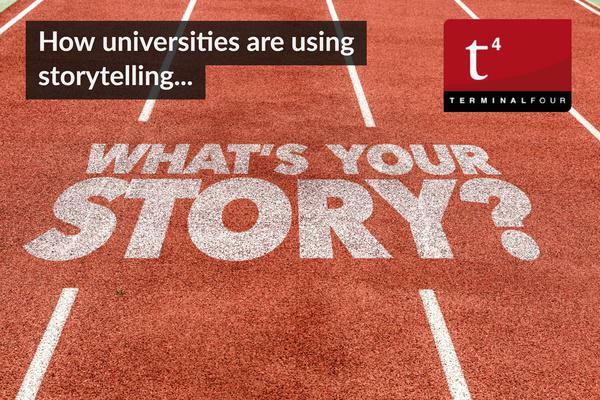 In this final installment, we want to take a look at some universities who are already using storytelling to help achieve their goals. If you were at the Higher Ed Web Conference back in October, you will have seen how storytelling was a popular subject. Whether it's a big budget TV advertisement or a blog post written by a student, storytelling is one of the most effective promotional tools at your disposal. We're going to take a look at stellar examples of storytelling within the higher education landscape and hope that they inspire you to start telling your own stories. Human Help: Working with student storytellers to drive engagement. One of the greatest problems faced by prospective students when they're trying to pick a university (and trying to figure out what to do with their lives) is a lack of real information about their chosen course. They will find lots of information in student brochures but nothing that will let prospective students know what student experiences are like. Throughout 2016-17, senior Bioengineering students, Erin Ichinotsubo, Brianna McIntosh and Nina Reese have been collecting first-person accounts from their fellow students. This has formed the “Humans of UW Bioengineering” blog. This talented team has shared stories of students' experience in the BioE major as well as their advice for prospective students. The stories have been published weekly on the department's website and Facebook page. Stories like these are priceless for students looking to make a decision about their future. The stories are personal and very much told in the voice of the individual. We mentioned this one in a recent Halloween edition blog post and even though it's probably no longer seasonally appropriate to be talking about Halloween, this one is still worth mentioning in the broader sense of storytelling. This is a perfect example of how storytelling can bring research to a wider audience; making it relatable, interesting and topical. There is a story behind every research project and every university can reach a wider audience by placing a narrative around their research. These are just three examples of how storytelling can bring humanity and humanity to the often clinical world of fundraising, recruitment and research promotion. Universities have a wealth of story tellers at their finger-tips from students, past and present, researchers, faculty and staff. All you have to do is find the stories on your campus and let them be told. We hope you have enjoyed this storytelling series and now we want to hear your stories. Send them to marketing@terminalfour.com and we would love to feature them.